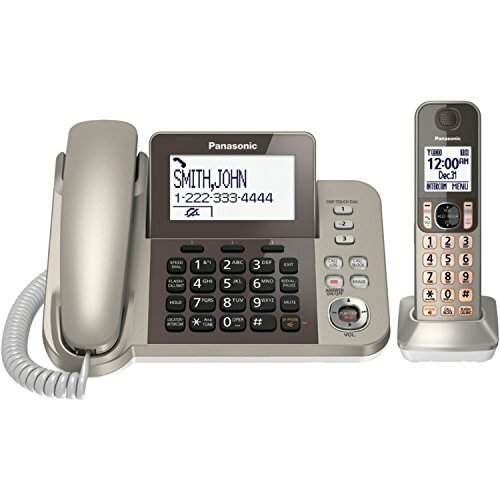 The Panasonic KX-TGF352N Digital Enhanced Cordless Telecommunications (DECT) 6.0* Corded / Cordless Phone System with Caller ID and telephone answering device (TAD) works great in any home or home office. Includes one cordless handset in the base unit and two additional cordless handsets, expandable up to six handsets. Baby monitor capability is built-in, so you can keep tabs on your children in their room. If you're tired of getting interruptions from telemarketers or robo callers, this phone system has a dedicated call block button. Just press the one-touch call block and the number will be registered in the phone system s database. Additional features include: Noise Reduction, Lost Key Finder, Extended Talk Time, Battery Backup system, Bi-lingual talking Caller ID, 3-way conference call and Two-Way Speakerphone on telephone's base unit and cordless handsets. Whether you're using the corded or cordless handset, this landline phone will give you everything you need in a home phone system. 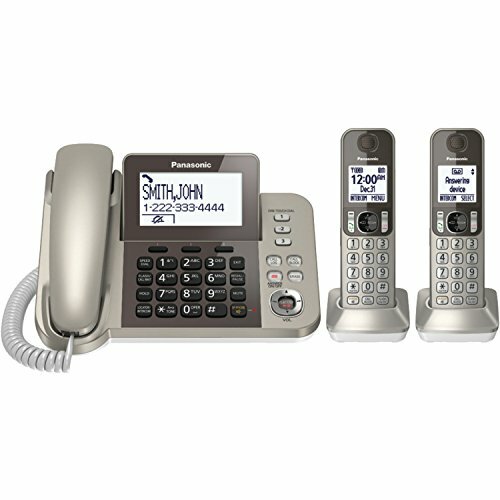 Guided feature tutorials are available for this corded/cordless phone system on the manufacturer s website. DISCLAIMER: * DECT 6.0 is a North American marketing term for DECT devices manufactured for the United States and Canada operating at 1.9 GHz. LCD language - English, Spanish. Block up to 250 numbers with one-touch Call Block on base unit and handsets, 1-touch call block, Dedicated Call Block buttons on the base unit and handsets let you register up to 250 unwanted numbers with 1 touch - even while the phone is ringing or while talking. You can also manually register numbers. Includes 3,000 number phone book, baby monitor and battery power backup, Clearly hear calls from noisy places. Noise reduction suppresses background interference while also enhancing voice tones for a clearer, more comfortable conversation. DECT 6.0 Technology. Caller ID Announce. HD Audio. with the extended power and signal range of advanced Class 1 Bluetooth, calls can made and received from both cellphone lines simultaneously, anywhere in and around the house. 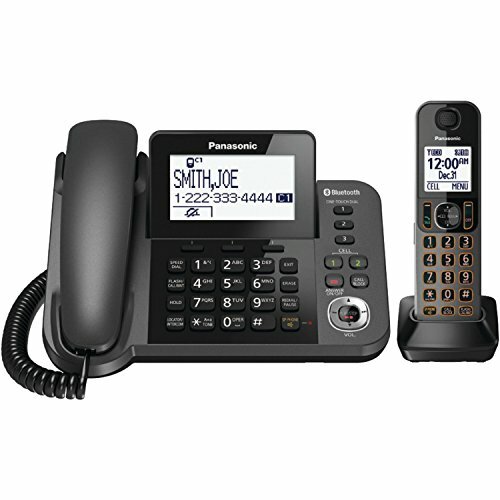 The Panasonic KX-TGF350N Digital Enhanced Cordless Telecommunications (DECT) 6.0 Corded/Cordless Phone System with Caller ID and telephone answering device (TAD) works great in any home or home office. Includes one cordless handset in the base unit and one additional cordless handset, expandable up to six handsets. Baby monitor capability is built-in so you can keep tabs on your children in their room. If you're tired of getting interruptions from telemarketers or robo callers, this phone system has a dedicated call block button. Just press the one-touch call block and the number will be registered in the phone system s database. Additional features include: Noise Reduction, Lost Key Finder, Extended Talk Time, Battery Backup system, Bi-lingual talking Caller ID, 3 way conference call and Two-Way Speakerphone on telephone's base unit and cordless handsets. Whether you're using the corded or cordless handset, this landline phone will give you everything you need in a home phone system. 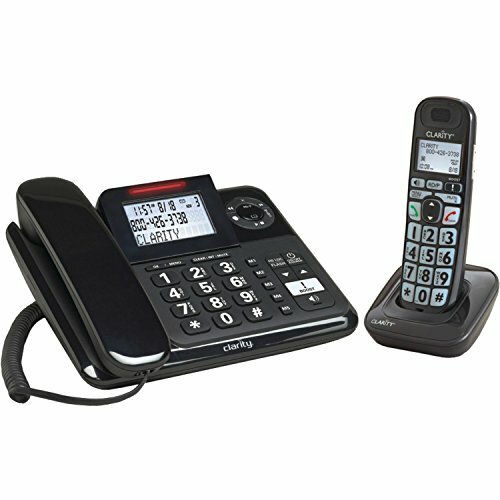 Guided feature tutorials are available for this corded/cordless phone system on the manufacturer s website. See, hear and make calls with ease with the AT&T CL84107 DECT 6.0 Expandable Answering System with Smart Call Blocker and Unsurpassed Range. The dial-in corded base means you'll always be able to make calls, even if the cordless handsets are temporarily misplaced. With this system, you can say goodbye to unwanted calls waking you up in the middle of the night or tying up the line. Robocalls are automatically blocked from ever ringing through-even the first time. You can also permanently blacklist any number you want with one touch. 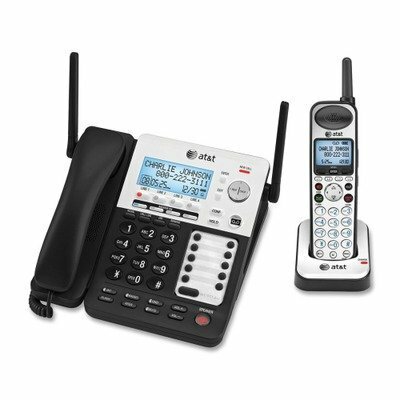 The AT&T CL84107 DECT 6.0 Expandable Cordless Phone with Smart Call Blocker also features a digital answering system that can record up to 22 minutes of incoming messages, outgoing announcements, and memos to help you stay organized. This reliable cordless system brings you long range, HD audio and extra features like caller ID announce and push-to-talk for effortless calls from any room in your home. Plus, the large buttons and extra-large screen make it easy to see and dial calls. The Clarity E814 amplified corded phone bundled with the D703HS amplified cordless handset offers you all the benefits of both phones at the same time These phones amplify incoming sound up to 40 decibels and have four tone settings to customize your listening experience. 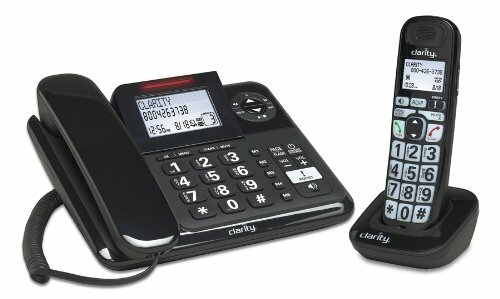 Both units include large, high-contrast CID displays, large keypads with high-contrast numbers, five speed dial buttons, and extra loud and clear speakerphone for hands-free conversations. The amplified digital answering machine makes it easier to listen to messages, and the CID displays light up as super bright visual ringers. Features full-duplex speakerphone allowing both parties involved in a telephone call to speak simultaneously and be heard clearly, as if they were having a face to face meeting. Amplifes incoming sound up to 40 decibels. Four (4) tone settings to customize your listening experience. Amplified digital answering machine making it easier to listen to messages. Large high contrast CID display. Extra loud and clear speakerphone for hands-free conversations. Large keypad with high contrast numbers. Five (5) speed dial buttons to store important numbers. Ten (10) loud ringer melodies with six (6) levels of volume. CID display lights up as super bright visual ringer. 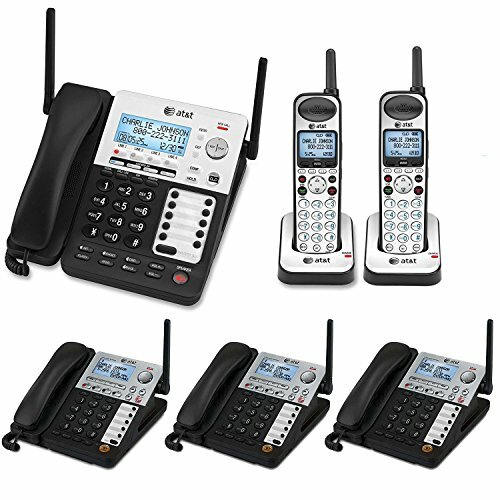 Expandable up to four (4) cordless handsets (model D703HS). One (1) year limited manufacturer's warranty. Amplified Phones: Yes. Answering Machine: Yes. Big/Jumbo Buttons: Yes. Corded or Cordless: Both. Number of Expandable Handsets: 4. Phone Bundles: Yes. Speakerphone: Yes. Visual Ringer: Yes. Color: Black. 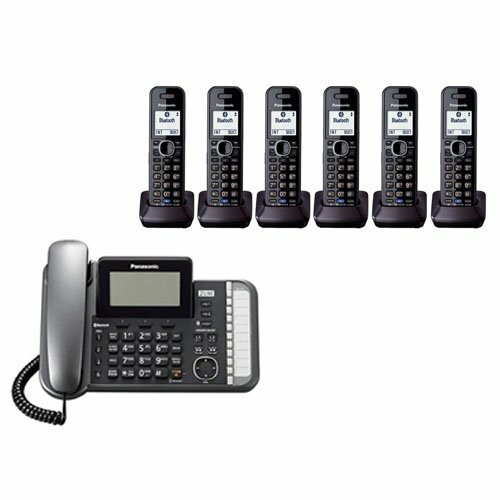 Expandable up to four (4) cordless handsets (model D703HS). Answering Machine: Yes. Big/Jumbo Buttons: Yes. Corded or Cordless: Both. Phone Bundles: Yes. Amplified Phones: Yes. Amplifes incoming sound up to 40 decibels. Four tone settings to customize your listening experience. Amplified digital answering machine making it easier to listen to messages. Large high contrast CID display. Extra loud and clear speakerphone for hands-free conversations. Large keypad with high contrast numbers. Number of Expandable Handsets: 4. Five speed dial buttons to store important numbers. Ten loud ringer melodies with six (6) levels of volume. CID display lights up as super bright visual ringer. Speakerphone: Yes. Visual Ringer: Yes. Color: Black. Country of Origin: China. Warranty: 1 Year. 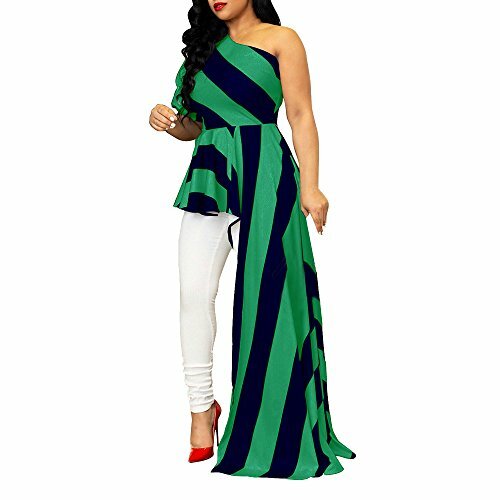 Dimensions: 5.5L x 7.5W x 9H. Product Weight: 3 lbs. The Panasonic KX-TGE445B expandable DECT 6.0 Phone with answering system, dual keypad and 5 cordless handsets is a smart, reliable home/home office solution designed to make everyday call management easier and more convenient for everyone, no landline required. Hear who's calling from across the room without having to get up with text-to-speech announcements in English and Spanish from the base unit and cordless handsets in the home/home office. 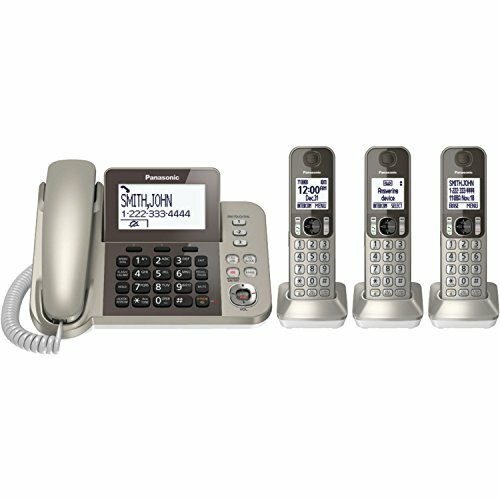 Easy call block, speakerphone, voice paging, power back-up operation, and advanced TAD (telephone answering device) functions tie it all together making this system one of the most reliable and functional systems available in the market today. Four-line SynJ system base is expandable up to ten handsets or desksets. Includes a separate mailbox and auto-attendant voicemail on each line. The large backlit display on the base and each handset is easy to read. 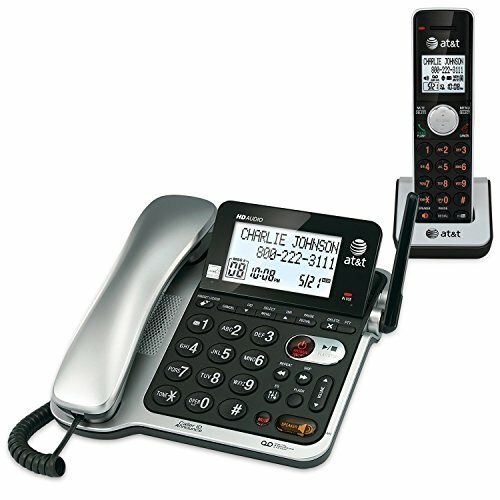 Features three-way calling, speed dial, redial, mute, hold, selectable ring tones and remote access. 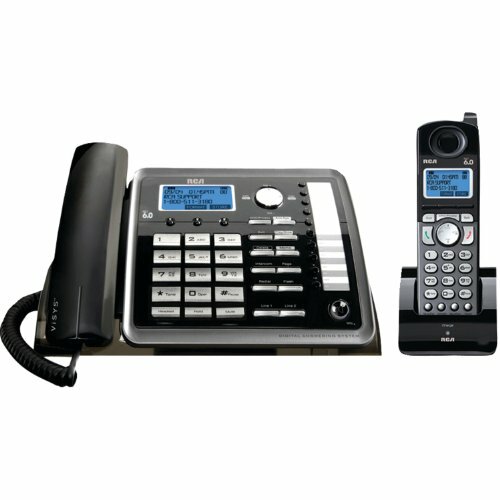 Answering System: Digital Lines: 4 Telephone Type: Corded Cordless Caller ID/Type: Standard Display.